In part 1 and part 2 of this series, we looked at ability scores and hit points. In this installment, we look at damage output for official fifth edition monsters. First, a note about how I calculated damage output (average damage per round, or DPR). 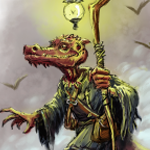 This topic is covered in a good amount of detail in the Dungeon Master’s Guide, but even with detailed guidelines, it’s not always a straightforward task. The general rule is to calculate the maximum amount of damage the creature can dish out in 3 rounds and divide by 3 to arrive at DPR. Area attacks are counted as doing double damage; the DMG bases this on an assumption that the attack hits two targets and both fail their saving throws, but I prefer to think of it as the attack hitting three targets, one of whom blows its saving throw and takes full damage while the other two succeed and take half damage each. The effect is the same either way (damage x2), but the presumption of one fail/two succeed is both more realistic in my experience and more useful when applied across the board to the effect of many types of attacks and powers. Those simple rules cover the broad middle ground nicely but leave lots of room for interpretation around the edges. For example, what about monsters that do ongoing damage that’s ended by a repeated saving throw? I assume the saving throw succeeds on the target’s second try. Because damage gets applied at different times—the start and end of both the target’s and the monster’s turn all make appearances—applying this assumption consistently across the board has different impacts on different monsters. My damage calculations are also based on what I consider to be realistic opportunities for damage. For example, the Monster Manual seems to assume that a triceratops will inflict its trampling charge damage every round; I consider that unlikely, even if it meets the requirements 3 rounds in a row. Instead, I adapt the “1 failed save / 2 successful saves” rule of thumb, which means the triceratops stomps one character, not three. That dramatically lowers its damage output from 46 points per round to 31—a drop of two offensive CR levels. The same limitation applies to attacks like the purple worm’s tail stinger. My assumption is that in 3 rounds of combat, one target will fail the saving throw and two will succeed, so the tail poison adds (42 + 21 + 21 =) 84 damage to the total, not 126. If an attack causes paralysis, petrification, or a similar effect that’s likely to take a player character completely out of the fight for at least 2 full rounds, that’s included as damage done according to a quick-and-dirty formula for PC hit points: (CR x 7) + 8. Fear, poison, and similar effects don’t count in this category. Frightened and poisoned characters still contribute to the fight, just not as effectively. Finally, where appropriate, monsters are considered to be prepared for hostility. The treant, for example, is assumed to already have two trees animated and ready to rumble before initiative gets rolled, so it doesn’t need to waste its precious first round waking up allies. Whew. That’s a lot of basic assumptions. Let’s finally look at . . .
*Except for the CR 30 tarrasque. It’s left off most of these charts because there are no monsters between it and the next toughest monsters at CR 24. The tarrasque’s lone data point adds no useful information, sitting out at the end of that big gap. If your monster uses the same attacks every round, then that number is your target for its damage. If you have a more complex monster whose attacks change from round to round—a dragon with a rechargeable breath weapon, for example, or a spellcaster—then you need to multiply the DPR number by 3 and aim to cause that much total damage over the span of 3 rounds. Chart 2 offers a slightly different view of the same data. It shows the minimum, maximum, and average damage at each challenge rating, making it useful for seeing how much play exists in the numbers at each CR. As usual, everything from CR 12 to 24 should be viewed with some skepticism, because there are only 48 creatures spread across those 13 CR levels. The formula given above varies somewhat by creature type, as you might expect. The numbers below are multipliers that can be applied for different types. An average beast, for example, does 30 percent more damage than the formula predicts. Numbers in parentheses indicate how many creatures of that type are in the MM, as a rough guide to how statistically reliable these numbers are. Oozes appraise so highly because of engulfing and splitting, both of which have the potential to double or triple their damage output—or not, depending on how the fight goes. They’re difficult monsters to rate because they have two complicating factors: their damage is trick-based and unreliable, and most oozes have annoying traits (such as ruining weapons) that make them nastier opponents than their deadliness alone implies. It’s easy to assume these multipliers are a guide to how much you should upgrade or downgrade a particular monster’s punch, but that’s not really the case. Instead, they afford a big-picture window into the balance between a creature type’s offensive and defensive ratings. Creatures with a multiplier much above 1 tend to get more of their overall challenge rating from offense than from defense; the higher the multiplier, the more those creatures tend to be glass cannons. At the other end of the scale are fey (who tend to be tricksters rather than death-dealers) and celestials (traditionally hard to kill). The split is interesting. Of the 14 creature types, five of them are balanced between offense and defense (multipliers between 0.96 and 1.12), and only two are weighted toward defense. 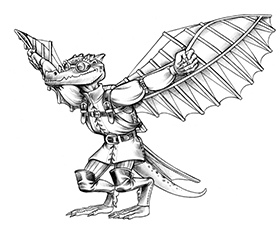 That leaves half the field weighted toward offense, which reveals something about the philosophy underlying fifth edition monster design; the game was engineered for sharp, short bursts of combat over drawn-out battles of attrition. Another way to describe that is an emphasis on excitement over predictability. In a long battle, the dice get rolled more and results accumulate toward the average outcome. In a short battle with fewer dice rolls, one or two lucky or unlucky blows play a bigger role. Emotionally, that’s more exciting. If you’ve played much fifth edition, you probably understood this already at a gut level. These numbers back up that intuition. Chart 3 compares the suggested average damage for monsters from the very useful Monster Statistics by Challenge Rating table in the DMG (in red) and actual average DPR from the Monster Manual (in blue). 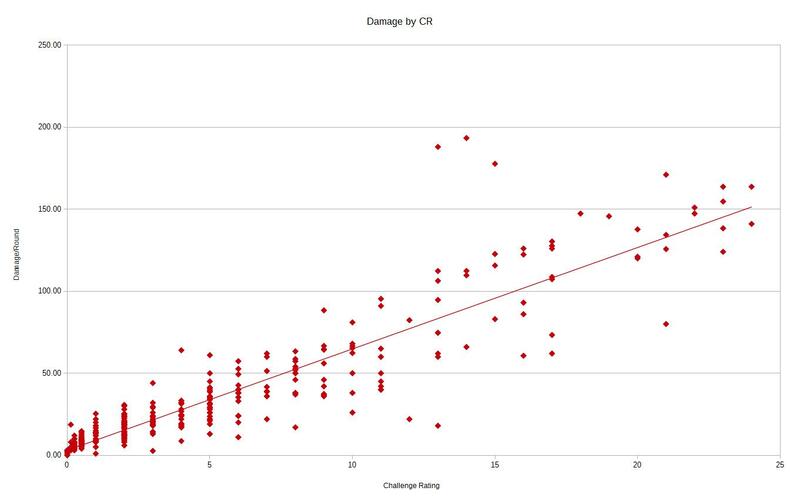 Below CR 1, actual damage is higher than the DMG suggestions by an average factor of about 1.5. (This is difficult to see on the chart because of the scale, but it’s there in the numbers.) The lower the monster’s CR, the higher the imbalance. This makes sense; low-CR monsters have few resistances or special traits to boost their defenses, so they’d be no challenge at all if they didn’t punch above their weight class. Above CR 11, actual damage is about on the nose with DMG suggestions. The scarcity of data points in that range (fewer than 20 percent of monsters are CR 12 or higher, remember) makes the graph fluctuate above and below the DMG line, but the average is about right. We see an intriguing droop at CR 12. 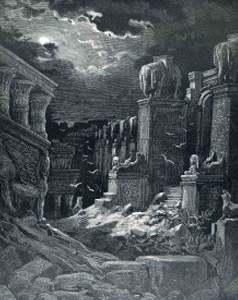 Only two creatures reside at that address: erinyes and arcanaloth. Erinyes is heavily weighted toward defense, so she drags down the CR 12 average. The most interesting stretch of this graph is from CR 1 to CR 11, where actual damage is about 90 percent of the DMG’s suggested level. The difference is remarkably consistent. We know that the monsters in that range aren’t weighted defensively; statistically, very few of them should be, and for most of them, the opposite will be true. This gap must mean that those monsters are getting 10 to 30 percent (roughly) of their offensive CR from features other than damage output. Possible culprits include higher-than-average attack bonuses, gang-up bonuses, and abilities that knock opponents down, grapple automatically, or cause other conditions, with or without saving throws. It’s worth noting that the Monster Features table in the DMG, which lists traits that boost a monster’s offensive or defensive CR, includes 16 features that alter a monster’s damage output but only four that boost its attack modifier, and those are the only offensive alterations covered. This implies a creature’s offensive challenge rating comes almost entirely from the damage it does, yet we see that actual DPR in the heavily populated range of CR 1-11 runs about 10 percent below the DMG’s recommendations—and this despite the fact that most monsters are offensively weighted. What’s going on here? How can monsters be offensively weighted if the average real DPR is below the recommended DPR? The answer is that conditions—grappling, poison, blindness, confusion, fear, and anything else that degrades a character’s ability to fight back—along with abilities that damage or destroy characters’ possessions, are factored into offensive ratings in ways that aren’t defined on the Monster Features table. This shouldn’t be surprising. The table focuses menu-like on recurring features, while many monster attacks are unique. It leaves a lot, however, to the monster designer’s judgment and experience (or even better, to playtesting), and discomfits people who like such things to be neatly codified. Every prospective designer of fifth edition monsters needs to get comfortable with this aspect of the process. Otherwise, if you depend on a limited menu of monster abilities, all you’ll get is cookie-cutter versions of monsters that everyone’s already seen. Next time: saving throws, skills, and other non-numerics enumerated. What a great read. Thanks. Looking forward to the next one! You say that assuming for an area of effect that it hits 3 targets and two make their save, is more realistic than assuming it’ll hit only two targets and both fail their save and I don’t disagree, but the way I read the monster creation rules (or guidelines rather) is that in calculating the damage per round you do not factor in any sort of miss chance with weapon attacks (and thereby don’t calculate the monster’s actual damage per round, because assuming all hits is also unrealistic). The examples always list damage numbers that assume the attack routine hits with every attack, without critting, and deals the average listed damage, so I deduce that they similarly go with assuming all targets fail their saves against damage effects that roll for saves even though that is unrealistic, because we’re not actually dealing with realistic numbers. And I think this assumption is further reinforced when you pay attention to the fact that save DCs and attack bonuses are factored into a creature’s offensive CR separately.